Ants are attracted to bits of food, so if you keep your counters spick-and-span, they’ll go elsewhere. I didn’t have huge numbers of ants (thank goodness), but I was determined to nip the infestation in the bud. The first step I took was to wipe down my counters and floors with white vinegar. This erases the trails of the “scout” ants, so that more ants won’t follow. Vinegar is also a cheap and effective cleaner and made my counters gleam like never before. For several days, I kept a bottle of vinegar within reach so that I could wipe down my counters immediately after cooking. I learned that soapy water, or water mixed with a detergent (such as Dawn), is also an effective way to keep ants off your surfaces. Wipe your counters with a soapy sponge, and then dry them. The residual film helps keep ants away. I also washed all of my containers of sugar, flour, cereal, honey, and syrup, making sure that they were tightly closed and that there was no sticky residue on the outsides. I moved fruits and vegetables to the fridge. After I had cleaned all my surfaces well, I still had the odd ant or two looking for a snack. I realized that ants were getting into my home through numerous cracks behind my counters. I looked for natural ways to keep them away and learned that ants don’t like spices such as cinnamon, cayenne pepper, mint, bay leaves, black pepper, cloves, and garlic. I sprinkled a little cinnamon into the crack beneath one counter and voilà! No more ants on that counter. But there were still a few wandering here and there elsewhere in the kitchen, so I placed a few bay leaves strategically around food items to deter them. I’ve also read that ants are repelled by cucumbers and used coffee grounds. I did notice that ants stayed away when I was cutting up a cucumber, and that they stay far away from the coffee machine. One way to make sure ants stay away from your house is to make sure they’re not being attracted by aphids in your garden. Aphids secrete a sticky-sweet substance called “honeydew” that ants love to eat. Ants will actually protect aphids from predators in order to preserve their honeydew source! Hose off your garden plants to wash off the aphids, or apply natural aphid repellents (like soapy water) to your plants. If your ant problem is too much for the aforementioned methods to handle, you may need to resort to the big guns. Mix some Borax powder (a natural mineral) with an equal amount of jam or syrup and place where ants congregate. Ants will be attracted to the sugar and will feast on the mixture, but the Borax will get into their systems and kill them. This method means you’ll have a lot of ants for a short amount of time, but it should get rid of them for several months. Borax has low toxicity to humans, but if you have small children or pets, you may wish to avoid this option. 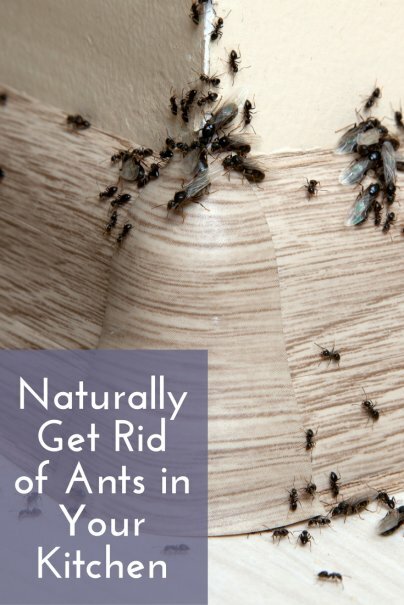 Even if you have only a few ants, it’s important to get rid of them quickly before they become a bigger problem. A friend of mine didn’t notice that ants had gotten into her maple syrup until one day she served pancakes and noticed a strange amount of black “pepper” in the syrup she had poured over them. Looking closer, she realized that they were little ants. Unfortunately, that was after she and her guests had already eaten half of their pancakes. Don’t let it happen to you! If you’ve had ants in your kitchen, what worked best for getting rid of them? I had a terrible problem with ants a kitchen once. One day a messy housemate had spilled s spot of powdered sugar on a counter and not wiped it up. I noticed that the ants were going single file back and forth from the powdered sugar. At least this is keeping them from getting into everything in the kitchen, I thought. So every day I added to the little pile of powdered sugar... after about three weeks, they were completely gone! The thought occurred to me that perhaps their "season" is done, and they'll be back next year. They never returned. ...The only reason I can think of for why this worked is that the workers did not spread out and bring a wide variety of foods back to the hive. The entire hive was living on sugar, and died out. I had killed 'em with sweetness. Interesting! Unfortunately my ants weren't leaving neat little trails like that - they just seemed to be everywhere! I wonder if they really did get killed off by the sugar? It might be the cornstarch that they mix with powdered sugar to prevent it from clumping, as ants can't digest cornstarch (from what I've read on the net). I don't have much to add. I'm in a battle with ants that doesn't seem promising for my side. :P Every time I think I've routed them, they come back in force. Last night I went into the bathroom to discover that something there had attracted them - I never figured out what - but there were hundreds all swarming in one area! Yuck! But I did want to add that I think different ants must have different food preferences - I know most of the time we think of ants being attracted to sweet, but sometimes I see what looks like the same kind of ant bypassing sweets to get to meat, or bread. It's very strange. Do you know anything about this? I suppose the methods are the same for conquering them, but what you have to clean up is different! I'd love to hear if someone does know about different ants being attracted to different foods. I can say from my own experience that I had a strain of ants one year who were totally turned off by chili powder, but next year's ants didn't mind it at all. Yes, I've heard that different ants are attracted to different things. Some might be more attracted to grease than sugar. For those, I've read that a mixture of Borax with peanut butter is the key to killing them off. I have an idea that when ants are in the bathroom, they are after water when the weather is hot. I wipe down everything I can in the summer, but it's not easy. Especially after a shower. The tiles, the bathroom ceiling, the water that gathers around the sink and bath knobs. It helps to leave the bathroom door open and the window too, to dry out. We've always had ant problems, but this year, they are coming back in full force. My husband sprayed around the outside of the house, I sprayed around the baseboards inside, laid traps everything, wiped the counters with vinegar, I've kept EVERY dish clean and out of the sink, and they STILL come back, more and more every day! They get in the cereal (until I got plastic containers), the trash, the cat food and everywhere! This morning, they were all over the CLEAN dishes in the dish drainer! I haven't tried the Borax because of the cat, but I may have to give in. Last night, my husband made pork chops and this morning I noticed that the ants in the trash were only crawling on the pork chop wrapper, which is the first time I've seen them go for something other than the sweet stuff. Important: Borax IS toxic to children and animals. (Google it) Please do NOT use it, plain or mixed. I have black ants (which don't bite) outside. To keep them and most crawling insects outside, I sprinkle a line of plain salt along door and window tracks. Vacuum and re-sprinkle every month or so. Love Wisebread. Hope this helps somebody else. When I said it has "low toxicity" to humans I meant that it isn't acutely toxic in low doses (people use it in laundry, after all), although it IS toxic for young children and pets if they eat it. That's why I recommended that if you have young children or pets, that you don't use it. Thanks for the clarification. If you DO have a toddler or pet who is likely to ingest it, don't use Borax in the house. Ugh, I hate ants so much...never had a problem with them till I moved to Texas and now it's all out warfare! Thanks for the tips! I find that mostly keeping the food and dirty dishes from lying around works the most in the house but the yard is another issue entirely. ANTS ANTS ANTS All over the sink and kitchen counter. I have tried baking soda and sugar, mixed in a paper cup and left in a small saucer. It's suppose to attract them for the sugar and track the soda to the nest. after a week they stopped going to the saucer, wouldn't touch it, but came back on the other side of the sink. I think in the hot weather, they want the water or moisture on the sink? So I wiped down everything I could, But it seems like there is always some water or moisture around, under and under the sink. Then I tried the traps for ants, and that seem to help. But they are always on the march. I have tried borax, find it in the laundry soap section at larger stores, and mix with suger, 50-50 and sprinkle outside, around the house. takes a awhile, but it works like the baking soda and sugar inside the house. i had a serious problem with ant infestation, especially in my kitchen. The ants even congregated in my dishwasher. I mixed 20 Mule Team Borax with equal amount of powdered sugar being sure to really blend the two ingredients thoroughly. I sprinkled this mixture on the ants' trail and voila, the ants started dying. However, after a few days, the 20 Mule Team Borax/powder sugar mixture got as hard a cement, and I had to chisel it off the countertops. This year, the ants returned and instead of sprinkling the mixture inside the kitchen, I went outside and found where the ants were marching. They were marching up the posts of my deck and on the beams under the deck. I sprinkled the mixture on the beams, and on the ground where they were congregating. Within three days, I observed hundreds of dead ants in and around the borax sugar mixture. There were one or two lone ants, but they were moving very slowly, like they were drunk. I will continue sprinkling this mixture outside weekly. By the way, the ants have stopped coming into my kitchen. This technique really worked for me. Thanks for the tips. I'm going to try them. We're having problems with ants, too, even in the living room, especially with the sofa. My kids tend to leave bits and pieces of food on it, that sometimes, while I'm contentedly seating, watching TV.. aww.. ants start attacking. arrgghh! That last paragraph is pretty nasty! Wow! I've tended to hit up the Raid more often than not, but you give some great alternatives here. A friend of mine swears by lemon juice though. I control outdoor ants with grits. They eat them and take them back to the colony and the queen eats then too. Cheap and works great for me. I have never had an ant problem in my house (knock on wood). But I had a water heater installed in my basement yesterday, and my cousin left the door open.He came upstairs and said - your basement has mosquitos all over it. Never have had them before. I saw a treatment online recently using a 2 liter bottle. Sure wish i could find it.I turned on a fan I keep in the basement and turned on the dehumidifer, so I am hoping this works. Do u cook the grits or just sprinkle them on the counters?